1. 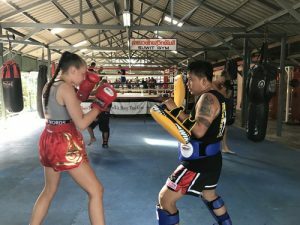 Using Brute Force- While the gyms in the West now acknowledge the importance of Muay Thai, the use of the art of clinching is still barely taught there. In the name of clinching the western folks are taught to grab the opponent’s neck and use their force to clinch him. In Thailand, this can easily fail with the use of a little technique. 2. Use of Only the Hands- The easiest sign to know that the person is a rookie in training is that he or she tries to rely on both their hands, and all they do is try to grab your neck with them. This technique never works with an experienced clincher, and if you try this against them you’ll be leaving your guard open, thus giving them the opportunity to get hits on you. 3. Going for the Knee- Most rookies think that the key to a healthy clinch is always going for the knee as and when the opponent swings it. If your opponent is experienced, he will use your range to get hits on you, because if you try this when their knee is on the swing you’ll be in their range. Instead try to clinch the opponent man or woman at a safe punching range. 4. Forgetting to Knee While Getting Clinched- When your opponent clinches you, it is necessary that you do not forget to use your knees so as to get yourself out of their grip. 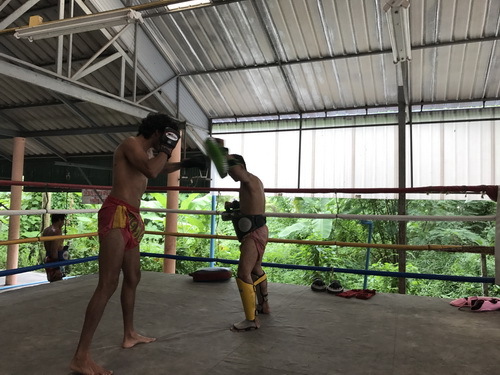 The key to winning in Muay Thai is that you score more points in the clinch than your opponent. For a better knee movement, we recommend you wear shorts, and for a better grip, gloves are your best bet. 5. Bending Down- It is the simplest of mistakes. When you bend down, you expose a wide area to your opponent which he or she can easily grab, and when your head is down, it is Quite tough to use your hands the way they’re meant to be. Always try and keep your head up while in a bout. Always remember to train under an experienced trainer so that you can learn the defects of your clinching position more personally and specifically. That is how you will improve your game.